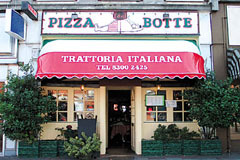 Dine in a typically Italian rustic atmosphere at Pizza Botte, complete with checked tablecloths, candle wax encrusted bottles and Italian memorabilia adorning the walls. A busy, bustling restaurant with a friendly ambience serving traditional Italian cuisine from the extensive a la carte menu complemented by a daily specials board and a wine list featuring Italian wines from various regions. Outside catering for dinner parties, buffets, barbecues and weddings prepared and served in your home or venue of your choice. Open for lunch Tue-Fri noon-2pm, dinner Mon-Fri 6-10.30pm, Sat 6-11pm, Sun noon-4pm. All major credit cards accepted (not Diners). 10% service charge. The food of Italy means pizza, spaghetti, ravioli, pasta parmigiana, and minestrone. It�s usually combined with vegetables, grains, fruits, fish, cheeses and a scattering of meats, fowl and game usually seasoned or cooked with olive oil and pungent with garlic. Cheese enhances the flavor of many dishes, making creamy sauces for pasta, and fusing perfectly with the other ingredients in lasagna. Italian foods are fragrant with seasonings, including the flat-leafed parsley, basil, rosemary, thyme, sage, and marjoram. Cloves, cinnamon, nutmeg, and saffron are popular spices.